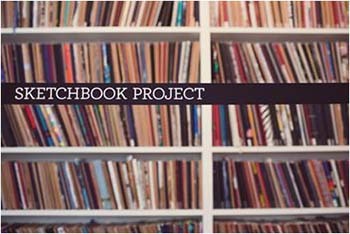 The Syracuse University Art Galleries will host the Sketchbook Project’s Mobile Library, a pop-up event that features thousands of artist sketchbooks traveling across North America stopping at museums, galleries and libraries. The mobile library will be on the Syracuse University Campus, parked in the Q4 parking lot, on Tuesday, Oct. 14, from 11 a.m. until 3 p.m. Emphasizing that “There’s nothing like getting to hold a sketchbook in your hands and flip through the pages,” the Sketchbook Project brings the analog experience of browsing the collection of more than 30,000 sketchbooks at the Brooklyn Art Library on the road with its highly popular mobile library. The library holds about 4,500 sketchbooks, featuring artists from over 135 countries. In addition to viewing the books, visitors will also have the opportunity to purchase their own sketchbook, fill the pages with their own artwork and contribute to the collection and greater community. The Sketchbook Project began in 2006 in Atlanta, and moved to New York City in 2009. Since that time, the small organization has grown into a worldwide community of more than 70,000 artists. By focusing on the intersection of hands-on art making and new technology, The Sketchbook Project nurtures community-supported art projects that harness the power of the virtual world to share inspiration in the real world. The flagship endeavor is The Sketchbook Project, a crowd-sourced library that features 31,471 artists’ books contributed by creative people from 135+ countries. Brooklyn Art Library is the storefront exhibition space in the heart of Williamsburg, Brooklyn, where The Sketchbook Project collection is on view to the public. Visiting the Sketchbook Library Mobile Library is free and open to the public. Complete information and related programming is available by visiting the SUArt Galleries website at suart.syr.edu or on Facebook at http://facebook.com/SUArtGalleries.